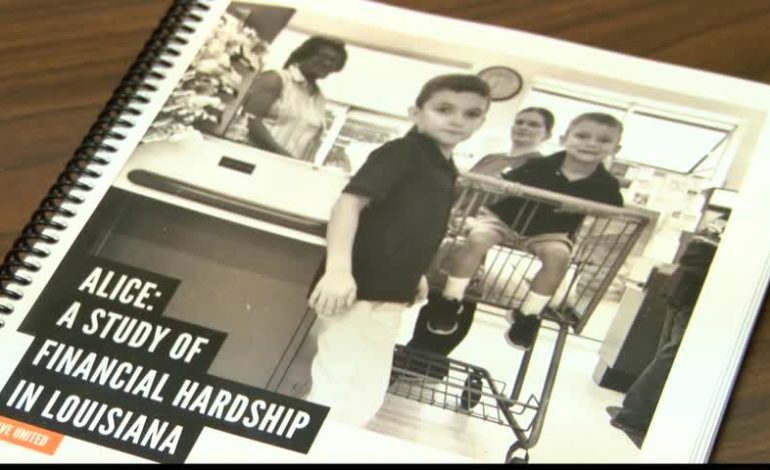 Nearly half of Acadiana Families are living families are living from paycheck to paycheck according to the 2018 ALICE Report released by the Louisiana Association of United Ways. ALICE stands for Asset Limited Income Restrained, Employed meaning they aren’t considered to be in poverty but are still struggling to make ends meet. “We saw some pretty significant increases in the amount of people who are barely surviving.” said Margaret Trahan, CEO of United Way of Acadiana. For most parishes in Acadiana nearly 50 percent of families are either classified as below the federal poverty line or ALICE. “This really makes sense when you consider what’s happened in our economy in the past three years with the downtown in the energy industry.” explained Trahan. “This was also the time in our state where so many families had a life changing event due to great floods.” Sarah Berthelot, President of the Louisiana Association of United Ways added. Trahan says they are fighting this by helping people file for an Earned Income Tax Credit. “One woman that we spoke to who gets this EITC, tells us that next to her birthday, it’s the happiest day of the year when she gets that tax check in the mail, because she knows she can pay off her bills and get out of debt at least once a year.” said Trahan. Berthelot acknowledges that there isn’t a easy way to reduce these numbers. “What we hope is that this report can be placed at the center of tables, tables in governmental offices in churches and non profit organizations, even around our own dinner table.” said Berthelot. “When you look at it, its easy to feel overwhelmed by the problems and the obstacles that are in their path but we leave better when we leave united.” said Trahan. United Way of Acadiana says they also plan to lobby the state legislature this year to advocate for policies that will boost funding for early child care and EITC to help families. United Way of St. Landry Evangeline is hosting “Breakfast with ALICE” Tuesday, January 22nd at 9 a.m. They are encouraging elected officials to attend. Find out more by clicking HERE.